Melt pump is a device for transporting, pressurizing and measuring high temperature and high viscosity polymer. 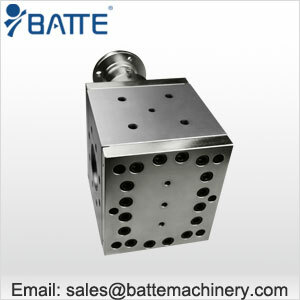 It is usually installed between the extruder outlet and the die to stabilize the pressure fluctuation at the extruder outlet and improve the accuracy of the cross-section size of plastic products. ZB series melt pump is used for conveying, pressurizing, stabilizing and measuring high temperature and high viscosity polyester melt. ZB series high temperature melt pump displacement from 20cc/R-630cc/R, the hourly output from 5Kg-5000Kg, can meet the matching requirements of single screw, cone double, flat double extruder, etc. ZC series high temperature melt metering pump can be applied to all kinds of pipelines and reaction kettles under the working conditions of 400 C and 40MP. The rotary displacement of FB series high temperature melt pump can be transferred from 5cc-8000cc to 2Kg-90000Kg per hour, which can meet the matching requirements of various pipelines and reaction kettles.